I enjoy researching and writing about Morrow County people who have excelled in areas that help to make our county an attractive place in which to live or visit. This week that person is Joanne Mathews, Cardington resident. Through the years, many of us have received each Christmas a detailed pen and ink drawing of historic Cardington buildings. Joanne meticulously drew them and placed the history of each on the back of the 5X7- inch card. These cards were and still are treasured. Joanne’s artistic ability was first noticed by her second grade teacher at Claridon School who rewarded her Crayola drawing of a Hyacinth with a figurine of a boy reading a book. Her parents recognized that talent also at a young age and enrolled her in a correspondence course with Art Instruction. There was no stopping her. She painted Christmas scenes on the front staircase hallway windows of the Nichols Street School when she was in eighth grade, was art editor of the Pirateer yearbook and was the first female allowed to be a student in drafting when she was a senior. Her teacher obtained special permission from the school’s board of education for her to be in his class. She learned mechanical drawing and then became employed in engineering at HPM, detailing power units for almost five years. While living in Leavenworth, Kansas, where her husband was stationed with the U. S. Army she was employed with the General Command and Staff College as an illustrator and when her work came to the attention of her superiors she was awarded with certificates recognizing her as an Outstanding Employee and a Performance Award, each signed by the Commanding Major General. Her lettering talents have been visible on advertising signs printed on barns, vehicles, boxes, trailers,tractors, manure spreader, windmill, sleighs and windows. She has recreated portraits on canvas using oils and acrylics, one of the most visible being that of Dr. Lowell Murphy in the rotunda of the Cardington-Lincoln High School where the gymnasium was named after him. Her painted jugs, like those of her artist mother, can be found across the country. She has painted scenes, figures, flowers, etc. on many unusual surfaces from a toilet seat, to bowling pins, balls, milk and cream cans slate, barrel and keg heads, saws and mailboxes. She is also a graduate of two courses in photography at Marion Technical College and for many years was photographer for her news writer sister with the Morrow County Independent, Morrow County Sentinel and The Marion Star. Her photography is as detailed and perfected as her art work. 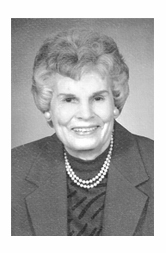 She was honored in 2006 by being inducted into the Cardington-Lincoln High School Alumni Hall of Fame. Joanne’s talent has helped to keep the history of Cardington alive in many artistic ways and I am proud to call her my sister. March, 1939: Flood waters in the village neared the 1937 mark when the crest of Whetstone Creek was about two feet below the mark of the flood in June, 1937. Sunday’s heavy rain occurred one day ahead of the 1913 anniversary of the 1913 flood. Cardington Village council initiated parallel to the curb parking on Main and Marion Streets. Previously, parking patterns had been diagonal to the curb. Gertrude Mack, Cardington librarian, reported the total 1938 circulation of the library was 12,597 books, largest circulation in the library’s history. March, 1949: The three Morrow County newspapers were classed among Ohio’s top weeklies in 1948 in towns under 2500 population when the awards were announced at the annual meeting of the Ohio Newspaper Association in Columbus. The Morrow County Independent, won first in classification in news coverage, the Union Register and Morrow County Sentinel, Mount Gilead, were among three papers receiving honorable mention. The Sentinel also received third award on the amount of advertising carried. The Knox County Citizen, edited by Cardington native Rarick Long, also received top awards. March, 1969: Two members of Cardington Lodge No 384, Free and Accepted Masons, Walter Briggs of Cardington and Nelson Campbell, Mt Gilead, were presented their 50 year membership pins.